Hello, witches, wizards, and Muggles alike! 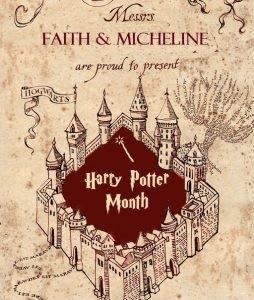 Another Harry Potter Month is upon us! We thought we’d do a quick intro-ish post to start things off. Please feel free to share your houses, patronuses, wands, and anything else HP in the comments! We’re looking forward to chatting about all things Potter with everyone all through July! It's a lot of fun! Next I need to find out which Westeros house I belong to, LOL! I had to look up what a Goshawk was, but it's pretty majestic. I think you're the first I met that got Salmon as their patronus. I've got a St. Bernard, a big fluffy furball of a patronus. Awww! A St. Bernard is so cute! ♥ Melissa was a little upset at first about the salmon, LOL, but I think she's OK with it now.